Wearable technology has gone beyond fancy prototypes, fit bands and wrist watches – it’s a self-evolving category. You can now have your GPS integrated ‘smart shoes’ to help you navigate while you are trekking, running or just roaming around. Take the example of LECHAL – a next level initiative for the die-hard trekkers to walk into unknown territories without being glued to their smartphones. The shoes are connected with an app to help you direct the direction and notify which side to take with a mild vibration. You can receive the navigation and get your fitness on point with its fitness tracker – an all in one support. Well, now it seems wearable is the breeding ground for players like Qualcomm, Intel, Samsung, and Apple. Even ecommerce giant like Amazon UK has introduced a wearable technology store which indicates that it’s unputdownable. It’s likely that wearables and apps are seemingly gaining huge popularity – which also opens up scope for startups having a wearable app idea. But is there a scope for startups and enterprises with wearable app development? “The wearables market is entering a new phase,” says Ramon T. Llamas– Research manager IDC Wearables team. Well, it seems YES, there is a scope. Wearable technology products have been recognized and received well over the past few years. From healthcare to security, and retail, wearable app development is trending as they are easy, flexible and convenient. 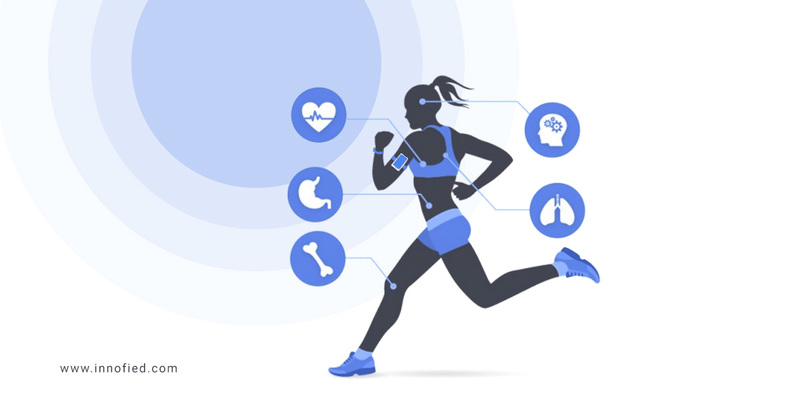 Security profiling, fitness tracking, and network monitoring contribute towards the adoption of wearable apps and technology. It saves time for busy millennials by enabling real-time data monitoring and offering operational efficiency. 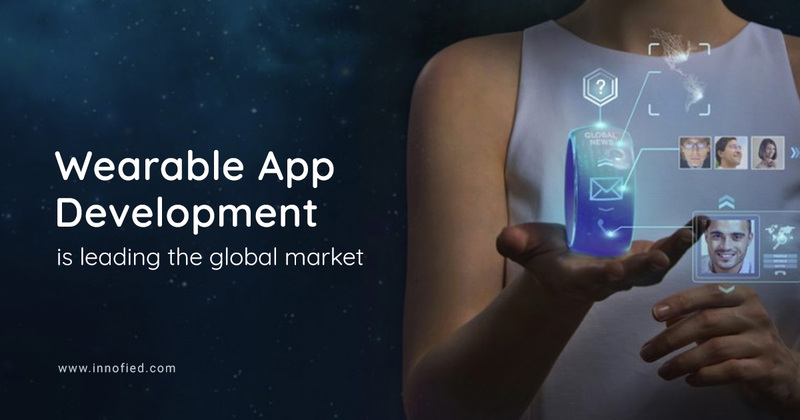 With an expected market value of $ 51.60 billion by 2022, wearable app development is on the verge of exponential growth. But, though IoT wearable app technology comes with many opportunities, it certainly has some challenges. Be it the architecture, technical or the hardware, IoT implementation is no child’s play. There are Roadblocks in Wearable App Development! 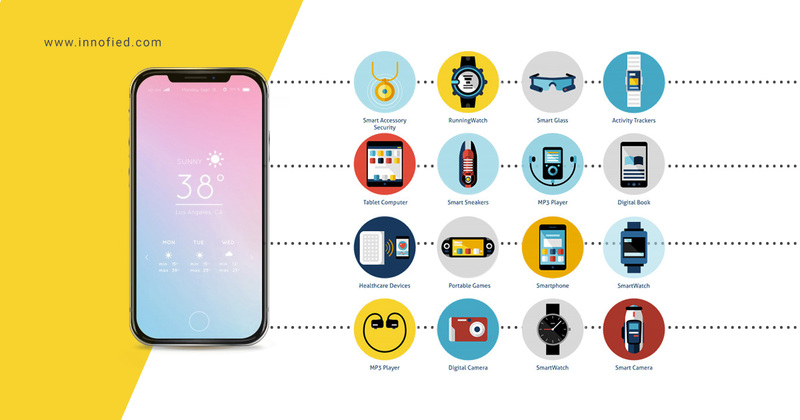 Internet of Things technology involves smart connected devices that work as wearables.Wearable technology is nothing but an addition to IoT. They can be cameras, fit bands, watches, and other physical sensors. Now, to establish a smooth connection between these devices and the app, it becomes tough to combine a big data volume. It is supported by interoperable components. Basically, an infrastructure is needed that will combine data to compare historical information, show relationship and enhance decision making. The architecture you build should be open and mustn’t restrict the user to be fixed and in an end-to-end solution. You need to create a structure that is flexible to identify RFID, tags, smart objects, intelligent devices that will include software and hardware solution. IoT can be very complex when it comes to connecting devices with mobile apps. First, there is heterogeneous architecture in existing technologies. Different applications need a unique environment and range. Secondly, communication has to be top notch, where you are offering real-time information through smartphones and wireless. And there will be different parties with different communication requirements and security needs and so forth. To summarize, the complexity of implementation and alternative technology can be a pain in your rear! Also, there are unnecessary deployment and competition in the market that provokes problems. There is a pressure to be better and efficient to connect as many as wearables as possible! Users of all age especially teens and millennials are adopting the trend of wearables. The expectation has increased to discerning levels – they want more and more from their smart devices. Even the current generation of wearables are not completely satisfying. And hence owners are abandoning wearables as their expectations are rising. 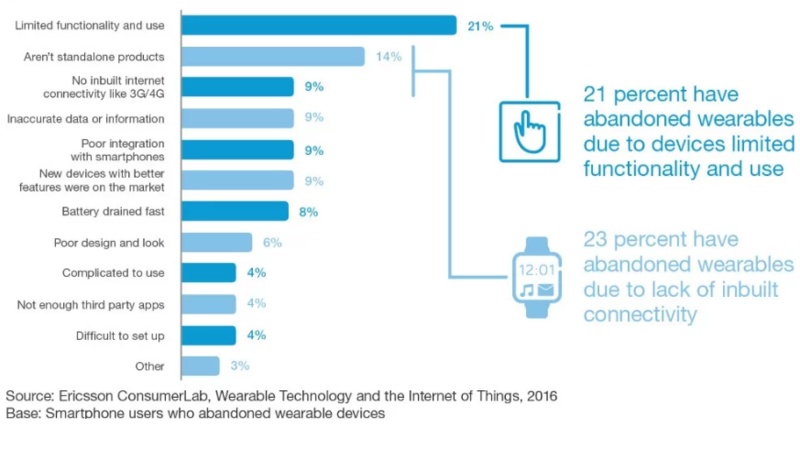 Here is a chart that explains the reasons for user abandoning wearables, as researched by Ericsson. So you see it’s all about making users satisfied with the maximum use of their wearable device. And it is possible with the right wearable app development solution that overcomes all these challenges and becomes a habit for users. The first step to surpass the hurdles, of course, is to choose the right industry to take the plunge for wearable app development. It’s about understanding the need and designing a solution for it. And wearable ideas which are in most need includes healthcare and fitness, payment and banking, security, travel, and entertainment. A. Why Wearable App Development for Health & Fitness Industry is Absolutely Profitable? Everyone is craving for a healthy lifestyle – well-maintained body, health, and peace of mind. And I’m sure you know the importance of sleep that contributes to a healthy living. This idea gave birth to sleep tracker IoTwearables in healthcare. It measures the good amount of sleep you enjoyed. Apps like Pebble Time is one of the most downloaded sleep tracking applications that automatically tracks the user’s sleep when he goes to bed, wakes up or is having a deep sleep. And the best part is the app can be personalized to find the solution for different needs. Another noted name is Android Sleep app which can be paired with your sleep tracker wearable. It wakes you up at the right time when your body feels well-rested. The application wakes the user using natural soothing sounds, puzzle alarms or captcha. It will track your sleep and warn you when you are sleep deficient to diagnose sleep illness. For sleep-deprived people like us, these apps are an absolute necessity. 2. Then there are apps for staying fit and energetic! And believe me, these fitness activity tracking wearables are widely popular. Fitbit surge is one of the most used fitness trackers in the market. It goes beyond just tracking your footsteps or pulse rate- Fitbit today can even track your sleep, share your activity with your community and let you compete! Guess the number of downloads for this baby? 50 gigantic millions! Isn’t that crazy how many people look out for fitness apps and wearables that can make them live a BETTER life? And here is your scope to fill up the gap. Your wearable app development idea of health fitness can be next big thing in the wearable industry. Stress is one of the biggest lifestyle health risks in our time. Busy schedules, constant impulsions, distractions and bad food habits have taken a toll. We are more prone to heart diseases, diabetes, obesity and anxiety which are nothing but grave lifestyle ailments. However, wearable app development technology is solving that. We have mood trackers and stress relieving apps to fight for us. PIP is a wearable technology that connects to the smartphone app. It aims to reduce your stress levels. It helps the user learn how to transform a depressing moment into a happy active moment. You just need to hold the device between index finger and thumb to measure skin conductivity. It promotes well-being by giving you a control over your stress. If you have a wearable app development idea for stress relief, there is definitely a market for you. If you are unsure about how to get started with your idea, our wearable technology experts can reach out to you! B. How Can You Start a Profitable Wearable App Startup for Payment & Banking Industry? Wearable app technology is really on its track to contribute a potential impact on payment and banking industry. You must have seen people in a flick through their smartwatches and other smart wristbands. 1. Banks can release promotions on their new features when their customers are near their branch/ATM. 2. Banks can integrate rewards and loyalties depending on the customer’s account balance and locality. 3. Customers can process a bill payment instantly after getting a notification about a particular location. Since banks can provide a unique experience for all their customers. And these smart wearable devices integrated with apps can be their best bet. Whether it’s payment, balance inquiry, offers on the god etc. wearable app development for banking and payment is definitely a great investment start. It is profitable for both user and banking entities. So if you successfully overcome the security concerns in your mobile app and smartwatch connectivity, you are good to go. Worried how would you do it? Have a quick 30 minutes FREE consultation to get started with your idea. Technology has already touched various sectors of the travel industry. Whether we consider the VR, instant messaging or on demand services, the wearable app technology can actually transform travel for good. I am going to be really specific and talk about the potential of wearable app development in travel industry through operators and customers perspective. Do you know British Airways created apps for Apple Watch for their passengers? The app helped passengers to store their boarding passes and get real-time notifications right on their wrist watch! If this surprises you, wait, let me tell you about what Mont Blanc did! Mont Blanc’s new wristwatch can do several functions hands-free. From exploring a new place through its turn-by-turn navigation to call a cab from Uber, travelers can explore different cities and nice places in a single tap. It is so comfortable and easy to use that it has opened a new potential for safe traveling. And hence has increased convenience for travelers all over the world. Startups can take a cue from this and can create more affordable alternatives that suit every budget. Hence, wearable app development for the travel industry is a big scope for entrepreneurs. These innovative ideas are not only unique but equally convenient and justified. There are wristbands, jewelry or clothing that can have panic buttons which can quickly send SOS to selected contacts. Though this is not new, a quick access is always more convenient than opening an app and sending SOS manually. This is again a wearables technology breakthrough that adds security to solo travelers be it men or women. This type of wearable app development has a good scope, as you get a wide range of audience. So, what do you think? 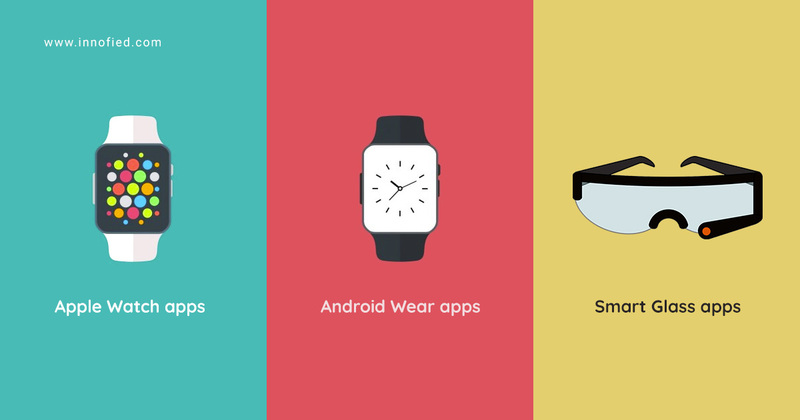 Which industry will cater most audience for wearable devices app development? Are you looking to develop a wearable app that is unique and serves a purpose? I think it’s the right time to take the plunge! The present generation of smartwatches, fitness bands, and smart shoes is just the holy beginning of a BIG change. Wearable technology will explode in impactful ways compared to smartphones. Soon traditional wristwatches, car keys, and even glucose monitors will be obsolete. If you think your wearable app development idea has potential, take the right step to manifest one. The time is NOW.